Following an impressive technical breakout the week prior that constituted the biggest combined jump in gold and silver prices in ten months, precious metals moved sharply higher again last week, capped by a late-week surge spurred by heightened expectations of more central bank money printing after Fed Chief Ben Bernanke defended previous easy money policies, what many viewed as paving the way for more of the same. After surging nearly $40 an ounce on Friday, the gold price ended at a five-month high while posting its biggest monthly gain since January, and silver jumped more than $1.00 an ounce after the Fed Chairman spoke, rising to its loftiest level in four months. For the week, the gold price rose 1.3 percent, from $1,669.70 an ounce to $1,691.30, and silver rose 3.1 percent, from $30.78 an ounce to $31.74. Spot gold is now up 7.8 percent for the year, down 12.0 percent from its 2011 high, and silver is up 13.9 percent in 2012, down 35.6 percent from its peak last year. 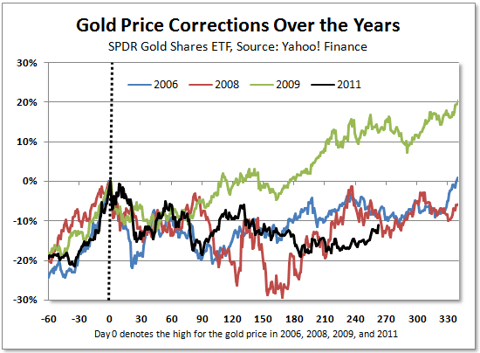 The recent move higher for the gold price appears far less impressive when viewed in the context of recent corrections as shown below and, importantly, the current recovery now appears to be "on track" with the last two major cyclical upturns that followed moves down that began in 2006 and 2008. As I've been saying for almost a year, this correction will likely prove to be a somewhat typical event in a long series of gold price corrections that now go back more than a decade to when the secular gold bull market began. Returning to the events of last Friday, it was an odd and exciting thing to see unfold as many analysts (including myself) feared that the absence of more concrete guidance on the next round of monetary stimulus might result in precious metals buyers heading for the exits, locking in already impressive August gains. In the weeks leading up to the Bernanke speech, bearish bets on the gold price had risen sharply as an increasing number of traders believed that recently improving economic data would make the Fed less likely to act. But, that was all changed by the August 22nd release of the minutes from the last policy committee meeting in which "many members" felt that more stimulus would be required "fairly soon" and this pushed precious metal prices out of their recent trading range, ushering in a new wave of technical buying that was exacerbated by Friday's developments. When the Bernanke speech was first released, the gold price sank due to the absence of any new specific signal that more monetary easing was imminent, however, after markets digested the full scope of the message - a strong defense of prior Fed actions and a clear willingness to do more - nearly every asset class rebounded, paced by big gains for the monetary metals. Upon further review, many analysts thought the use of the term "grave concern" regarding the U.S. labor market was the clear signal that markets were looking for, making the question of more money printing one of "when", not "if", thus paving the way for more Fed action at one of the three meetings before year-end. With Bernanke's Jackson Hole speech now out of the way, attention turns to the August U.S. labor report to be released on Friday where, if the growth in nonfarm payrolls proves disappointing or if the jobless rate again rises, the Fed's "grave concern" about the job market may prompt action the following week when the Fed's policy committee next meets. Developments in Europe will also be a key factor in whether the two-week long rally in gold and silver prices continues as the ECB (European Central Bank) meets on Thursday to deliberate over what, if anything, to do about nearly an entire continent that is now in recession and sovereign credit markets that continue to be shaky, as evidenced by bond yields on 10-year Spanish debt that continues to creep back up toward the important seven percent mark. ECB President Mario Draghi will likely offer up details of the bank's latest plans to buy bonds, however, implementation of the plan has become dependent upon the September 12th German Constitutional Court ruling on the legality of Europe's permanent bailout fund. The potential for new monetary stimulus in China following Saturday's report that manufacturing slumped to a nine-month low could also influence metal prices and August saw the strongest inflows to gold ETFs in nearly a year, the giant SPDR Gold Trust ETF (NYSEARCA:GLD) adding an impressive 38 tonnes in an indication that hedge funds and retail investors are once again interested in this sector. All of this sets up the month of September to be a potentially exciting one for gold and silver. Disclosure: I am long GLD. I wrote this article myself, and it expresses my own opinions. I am not receiving compensation for it (other than from Seeking Alpha). I have no business relationship with any company whose stock is mentioned in this article. Additional disclosure: I also own gold and silver coins and bars.